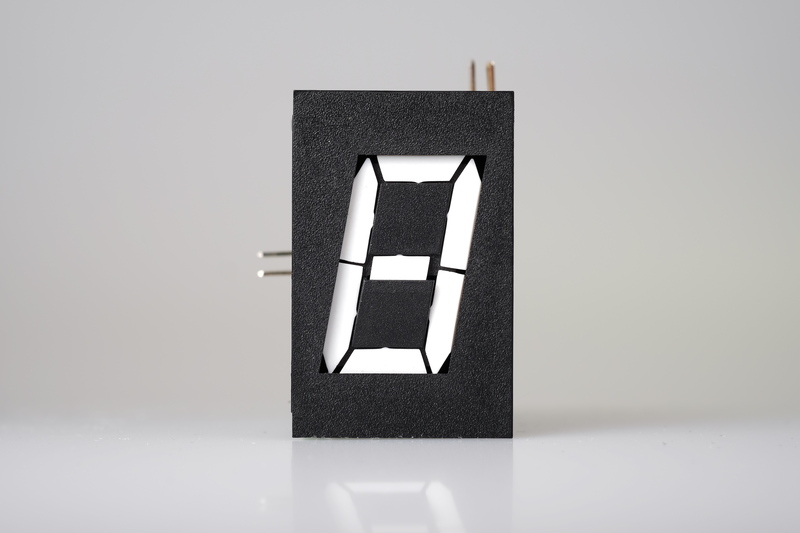 For small numeric displays these modules offer the optimum in visibility, reliability and economy. Consisting of 7 electromagnetic operated light reflecting segments, the module can display the digits 0-9, plus a limited selection of alpha characters. The character height is 1" (26mm). These modules are manufactured on original FP Electronics equipment purchased by Alfa-Zeta and according to FP specifications. Each segment contains a permanent magnet which interacts with an electro-magnet. A current pulse activates a reversal of the magnetic field induced in the electromagnet which determines whether the segment is exposed (set) or retracted (reset). The segments are molded from a white UV resistant material to ensure high visual impact over a wide ambient light range, including direct sunlight. The background color is matte black. The light reflecting segments provide excellent visibility over a wide range of ambient light conditions, and are readable up to 50ft (15.2m) away. Visibility increases with an increase in the ambient light level. There are no lamps to burn out and no mechanical linkages to wear out. The segments are rated for over 250 million operations. The modules are highly resistant to shock and vibration and are particularly suited to mobile applications with wide temperature extremes. Millions of these units have been in operation worldwide for over 20 years. No other display technology can match this performance and reliability. Power is only required to change the data displayed. Magnetic memory retains the display indefinitely without power being applied. module dimension (W/H/L): 1,072" x 1,690" x 0,962"
Segment mechanical turning time is within 15msec maximum. At these coil drive parameters, the duty cycle for driving the same segment must be less than 5% (on/off time) therefore allow at least 900msec before driving the same segment again. This will ensure that the segment coil will not accumulate heat. Set current direction drives the segment to be shown, reset current direction is reversed to drive the segment to be hidden. The module must be protected from the temperature extremes created by sunloading on the display enclosure. A UV screening material should be included in the design of the enclosure window. Life test (at 14 operations per minute) is currently over 94 million operations without any failure.